Name Variation H. Ernest Reuter was also known as Ernest Henry. H. Ernest Reuter was born on 18 November 1899 at Wisconsin. He was the son of Bernard Reuter and Ruth Elizabeth VanNatta. H. Ernest Reuter died in February 1967 at age 67. H. Ernest Reuter obtained US Social Security Card at Wisconsin; last residence Potosi, Grant, Wisconsin. [S245] U.S. Federal Census 1900 U.S. Federal Census, by Ancestry.com, ED34. Dwelling 157. [S243] U.S. Federal Census 1920 U.S. Federal Census, by Ancestry.com, ED 103. Stamp 6. Sheet 6A. Name Variation Mary Ida Reuter was also known as Ida. Mary Ida Reuter was born on 3 July 1903 at Wisconsin. She was the daughter of Bernard Reuter and Ruth Elizabeth VanNatta. Name Variation A. Virgil Reuter was also known as Virgil Aaron. A. Virgil Reuter was born on 9 September 1904 at Wisconsin. 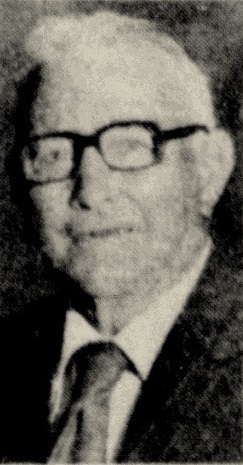 A. Virgil Reuter died in October 1978 at age 74. A. Virgil Reuter obtained US Social Security Card at Wisconsin; last residence Platteville, Grant, Wisconsin. Name Variation E. Lester Reuter was also known as Lester Edgar. E. Lester Reuter was born on 3 March 1906 at Wisconsin. E. Lester Reuter married Mildred M. Pitzen, daughter of Charles Pitzen and Mary Miller, on 9 August 1927 at Tennyson, Grant, Wisconsin. E. Lester Reuter died in September 1987 at age 81. E. Lester Reuter obtained US Social Security Card at Wisconsin; last residence Potosi, Grant, Wisconsin. 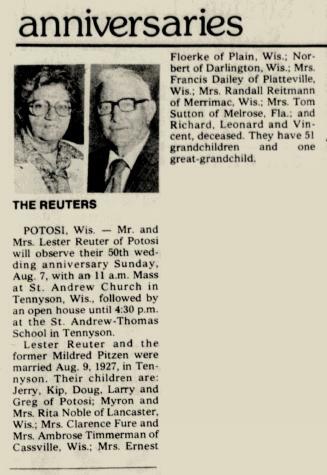 In July 1977 50th wedding anniversary of Lester and Mildred (Pitzen) Reuter. Name Variation Bernard Henry Reuter was also known as H. Ben. Name Variation Bernard Henry Reuter was also known as Barney. Name Variation Bernard Henry Reuter was also known as Ben. Bernard Henry Reuter was born on 30 October 1893 at Iowa. Bernard Henry Reuter married Louisa Mae Gillilan, daughter of William Gillilan and Jane Coyle, circa 1917. Name Variation Louisa Mae Gillilan was also known as Francis M.
Name Variation Louisa Mae Gillilan was also known as Louise M.
Name Variation Louisa Mae Gillilan was also known as Louisa. Married Name circa 1917 As of circa 1917,her married name was Reuter. Louisa Mae Gillilan was born in July 1894 at Wisconsin. She was the daughter of William Gillilan and Jane Coyle. Louisa Mae Gillilan married Bernard Henry Reuter, son of Bernard Reuter and Ruth Elizabeth VanNatta, circa 1917. Louisa Mae Gillilan died after 1970. [S245] U.S. Federal Census 1900 U.S. Federal Census, by Ancestry.com, Year: 1900; Census Place: Harrison, Grant, Wisconsin; Roll: T623_1790; Page: 9B; Enumeration District: 34. Grover H. Reuter was born on 3 August 1919 at Wisconsin. He was the son of Bernard Henry Reuter and Louisa Mae Gillilan. Grover H. Reuter married Marcella Hoffman, daughter of Al J. Hoffman and Mary Johnson, on 6 November 1947. Grover H. Reuter died on 14 January 1969 at age 49. Grover H. Reuter obtained US Social Security Card at Wisconsin; last residence not specified. Name Variation Anna Degenhardt was also known as Degenhard. Married Name 7 February 1893 As of 7 February 1893,her married name was Zenz. Anna Degenhardt was born in May 1871 at Wisconsin. She was the daughter of Michael Jacob Degenhardt and Elizabeth Mikesch. [S246] U.S. Federal Census 1880 U.S. Federal Census, by Ancestry.com, NA Film Number T9-1427 Page Number 334C. [S245] U.S. Federal Census 1900 U.S. Federal Census, by Ancestry.com, Year: 1900; Census Place: Waterloo, Grant, Wisconsin; Roll: T623_1790; Page: 1A; Enumeration District: 53. Mary Teresa Stoll was born in July 1857 at Grant, Wisconsin. Mary Teresa Stoll died on 19 July 1917 at Grant, Wisconsin. [S5] Wisconsin, Wisconsin Marriages, 1835-1900, listed as John Zenz. Name Variation Matthew John George was also known as Mathias John. Name Variation Matthew John George was also known as Matt. Matthew John George was born on 21 December 1867 at Germany. He married Mary Ann Rupp, daughter of John Rupp and Gertrude Byer, on 6 June 1899 at Maryhill, Cherokee, Iowa. Matthew John George died on 2 February 1944 at age 76. He was buried after 2 February 1944 at Evergreen Cemetery, Hot Springs, Fall River, South Dakota. [S244] U.S. Federal Census 1910 U.S. Federal Census, by Ancestry.com, ED25. Sheet 8A. Married Name 28 April 1908 As of 28 April 1908,her married name was Rupp. Regina Peters was born in 1880. She married Engelbert John Rupp, son of John Rupp and Gertrude Byer, on 28 April 1908 at Cherokee, Cherokee, Iowa. Regina Peters was buried in 1943 at Mount Calvary Cemetery, Portland, Multnomah, Oregon. William Peter Rupp was born on 25 July 1880 at Potosi, Grant, Wisconsin. William Peter Rupp married Cora Peck on 9 February 1904 at Cherokee, Cherokee, Iowa. William Peter Rupp died on 29 November 1931 at Adrian, Noble, Minnesota, at age 51. He was buried after 29 November 1931 at Adrian Cemetery, Adrian, Nobles, Minnesota. Married Name 9 February 1904 As of 9 February 1904,her married name was Rupp. She married William Peter Rupp, son of John Rupp and Gertrude Byer, on 9 February 1904 at Cherokee, Cherokee, Iowa. George Anthony Rupp was born on 14 July 1882 at Cherokee, Cherokee, Iowa. George Anthony Rupp married Mary Elizabeth Kohns, daughter of Peter Kohns and Josephine S. Ament, circa 30 June 1909. George Anthony Rupp was buried in 1956 at Mount Calvary Cemetery, Cherokee, Cherokee, Iowa. He died in 1956 at Cherokee, Cherokee, Iowa. In June 1954 at Cherokee, Iowa, George and Mary (Kohns) Rupp 45th wedding anniversary. [S243] U.S. Federal Census 1920 U.S. Federal Census, by Ancestry.com, ED29. Dwelling 72. Name Variation Mary Elizabeth Kohns was also known as Maude. Married Name circa 30 June 1909 As of circa 30 June 1909,her married name was Rupp. Mary Elizabeth Kohns was born in June 1887 at Iowa. She was the daughter of Peter Kohns and Josephine S. Ament. Mary Elizabeth Kohns married George Anthony Rupp, son of John Rupp and Gertrude Byer, circa 30 June 1909. Mary Elizabeth Kohns was buried in 1970 at Mount Calvary Cemetery, Cherokee, Cherokee, Iowa. Name Variation Herman Jacob Rupp was also known as Jacob Herman. Name Variation Herman Jacob Rupp was also known as Harmon. Herman Jacob Rupp was born on 20 February 1884 at Rock, Cherokee, Iowa, also reported as Feb 1885. Herman Jacob Rupp married Margaret Elizabeth Thiel on 30 October 1905 at Maryhill, Cherokee, Iowa. Herman Jacob Rupp died on 3 June 1970 at Clarkfield, Yellow Medicine, Minnesota, at age 86. He was buried after 3 June 1970 at Saint Andrews Catholic Cemetery, Granite Falls, Yellow Medicine, Minnesota. Name Variation Margaret Elizabeth Thiel was also known as Maggie E.
Married Name 30 October 1905 As of 30 October 1905,her married name was Rupp. Margaret Elizabeth Thiel married Herman Jacob Rupp, son of John Rupp and Gertrude Byer, on 30 October 1905 at Maryhill, Cherokee, Iowa. Henry Frank Rupp was born on 9 October 1886 at Rock Township, Cherokee, Cherokee, Iowa, also reported as Oct 1887. Henry Frank Rupp married Anastasia Kohns, daughter of Peter Kohns and Josephine S. Ament, on 20 August 1912 at Maryhill, Cherokee, Cherokee, Iowa. 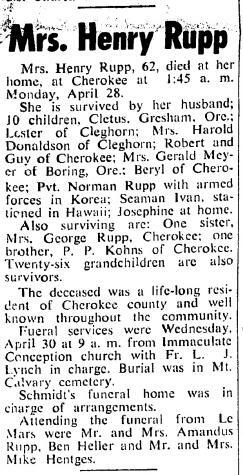 Henry Frank Rupp died on 13 June 1954 at Cherokee, Cherokee, Iowa, at age 67 Henry F Rupp obituary. He was buried after 13 June 1954 at Mount Calvary Cemetery, Cherokee, Cherokee, Iowa. [S243] U.S. Federal Census 1920 U.S. Federal Census, by Ancestry.com, ED29. Dwelling 91. [S250] U.S. Federal Census 1930 U.S. Federal Census, by Ancestry.com, Year: 1930; Census Place: Sheridan, Cherokee, Iowa; Roll: 647; Page: 1A; Enumeration District: 21; Image: 497.0; FHL microfilm: 2340382. Name Variation Anastasia Kohns was also known as Anna. Name Variation Anastasia Kohns was also known as Kohn. 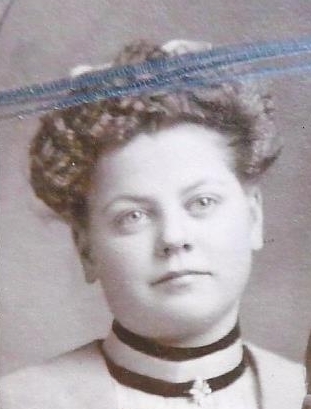 Name Variation Anastasia Kohns was also known as Annie. Married Name 20 August 1912 As of 20 August 1912,her married name was Rupp. Anastasia Kohns was born in July 1889 at Iowa. Anastasia Kohns married Henry Frank Rupp, son of John Rupp and Gertrude Byer, on 20 August 1912 at Maryhill, Cherokee, Cherokee, Iowa. Anastasia Kohns died on 28 April 1952 at at home, Cherokee, Iowa, at age 62 Mrs Henry Rupp (Anastasia Kohns) obituary. Peter John Rupp was born on 7 October 1892 at Rock Township, Cherokee, Cherokee, Iowa, also reported as 18 Aug 1888 and Oct 1893. Peter John Rupp married Bessie Irene Ryan on 9 April 1913 at Ime. Con. Church, Cherokee, Cherokee, Iowa. Peter John Rupp was buried in September 1962 at Mount Calvary Cemetery, Cherokee, Cherokee, Iowa. He died in September 1962 at age 69 also reported as 27 Jun 1960. Married Name 16 January 1912 As of 16 January 1912,her married name was Rupp. Elizabeth Beckman was born on 1 September 1886 at Calmar, Iowa. She married Fred J. Rupp, son of John Rupp and Gertrude Byer, on 16 January 1912 at Calmar, Iowa. 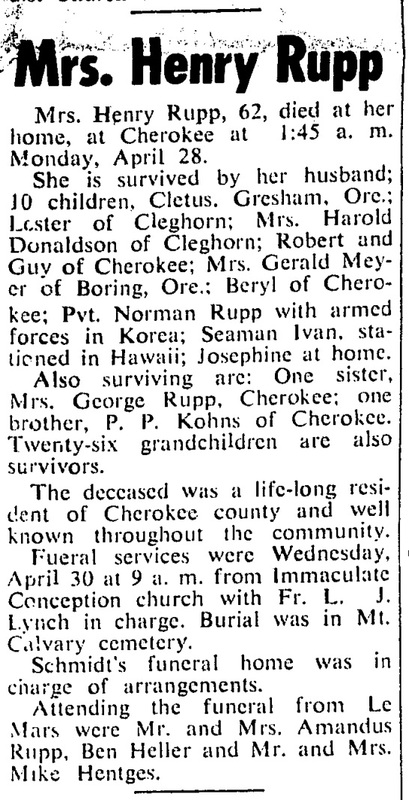 Elizabeth Beckman died on 23 March 1966 at Sioux City, Iowa, at age 79 Mrs Fred J Rupp (Elizabeth Beckman) obituary. Name Variation Katherine Mary Rupp was also known as Kate. Name Variation Katherine Mary Rupp was also known as Kathryn Mary. Name Variation Katherine Mary Rupp was also known as Katie. Name Variation Katherine Mary Rupp was also known as Catherine Mary. Katherine Mary Rupp was born on 7 August 1890 at Rock Township, Cherokee, Cherokee, Iowa, also reported as 06 Aug 1890 and Aug 1891. She was the daughter of John Rupp and Gertrude Byer. As of 1925, Katherine Mary Rupp was never married. She died on 14 June 1940 at Cherokee, Cherokee, Iowa, at age 49. She was buried after 14 June 1940 at Mount Calvary Cemetery, Cherokee, Cherokee, Iowa. 1 January 1925 Cherokee Ward 1, Cherokee, Iowa Katherine Mary Rupp appeared on the census of 1 January 1925 in the household of John Rupp at Cherokee Ward 1, Cherokee, Iowa. Gertrude Byer Rupp and daughters Kate and Mary. In June 1916 at Potosi, Grant, Wisconsin, John Rupp, of Cherokee, Iowa, is visiting with his brothers, Buck and Peter Rupp, and his sister, Mrs Theodore (Katherine) Mioski (Meoska). He is accompanied on his visit by his daughter, Miss Katie. Mr Rupp moved from Potosi and settled on a farm near Cherokee thirty-six years ago. He has retired from farming and is now living in the city. Name Variation Edward Fred Rupp was also known as Fred. Edward Fred Rupp was born on 3 October 1894 at Cherokee, Cherokee, Iowa, also reported as Oct 1895. Edward Fred Rupp married Alta B. Wright on 30 June 1930. Edward Fred Rupp obtained US Social Security Card at California; last residence Santa Rosa, Sonoma, California. Married Name 7 December 1918 As of 7 December 1918,her married name was Bush. Married Name 30 June 1930 As of 30 June 1930,her married name was Rupp. Alta B. Wright was born on 3 July 1892 at Montana also reported as 3 Jul 1894. She married Albert J. Bush on 7 December 1918. Alta B. Wright married Edward Fred Rupp, son of John Rupp and Gertrude Byer, on 30 June 1930. Alta B. Wright obtained US Social Security Card at California; last residence Santa Rosa, Sonoma, California. John Franky Rupp was born on 25 October 1896 at Cherokee, Cherokee, Iowa, also reported as 01 Nov 1896. John Franky Rupp died on 6 November 1896 at Cherokee, Cherokee, Iowa, also reported as 13 Nov 1896. He was buried on 7 November 1896 at Sheridan Township, Cherokee, Iowa. Peter Joseph Schiffman was born on 7 August 1818 at Prussia. Peter Joseph Schiffman died circa 1897. 1855 Wisconsin State Census, Potosi, Grant, Wisconsin He appeared on the census of 1855 at Wisconsin State Census, Potosi, Grant, Wisconsin, Page: 009. Peter Joseph Schiffman was a miner in 1850. [S249] U.S. Federal Census 1850 U.S. Federal Census, by Ancestry.com, Dwelling 809. Stamp 57. Written page 113. [S248] U.S. Federal Census 1860 U.S. Federal Census, by Ancestry.com, Dwelling 184. [S247] U.S. Federal Census 1870 U.S. Federal Census, by Ancestry.com, Page 67. Dwelling 488. [S246] U.S. Federal Census 1880 U.S. Federal Census, by Ancestry.com, NA Film Number T9-1427 Page Number 354D. Name Variation Gertrude Schwab was also known as Catherine. Name Variation Gertrude Schwab was also known as Keotreat. Married Name 18 November 1847 As of 18 November 1847,her married name was Schiffman. Gertrude Schwab was born on 12 June 1830 at Bavaria, Germany. She was the daughter of Louis Schwab. Gertrude Schwab died on 6 November 1919 at at the home of her son Bert, Potosi, Grant, Wisconsin, at age 89 Mrs Gertrude (Schwab) Schiffman obituary. Edward Schiffman was born on 24 July 1856 at Potosi, Grant, Wisconsin. He was the son of Peter Joseph Schiffman and Gertrude Schwab. Edward Schiffman married Anna M. Beau circa 1882. Edward Schiffman died on 1 December 1943 at Potosi, Grant, Wisconsin, at age 87. Married Name Her married name was Carpenter. Married Name 12 September 1897 As of 12 September 1897,her married name was Sanborn. Catherine Schiffman married Charlie Pitzen. Catherine Schiffman married George Carpenter. Catherine Schiffman was born on 26 March 1864 at Potosi, Grant, Wisconsin. She was the daughter of Peter Joseph Schiffman and Gertrude Schwab. Catherine Schiffman married Byron Sanborn on 12 September 1897 at Jamestown, Grant, Wisconsin. Catherine Schiffman died on 28 March 1932 at Potosi, Grant, Wisconsin, at age 68. Name Variation Engelbert Schiffman was also known as Bert. Engelbert Schiffman was born in April 1870 at Potosi, Grant, Wisconsin, also reported as 23 Jun 1870. Engelbert Schiffman married Sarah Beyer on 9 May 1899 at Potosi, Grant, Wisconsin. 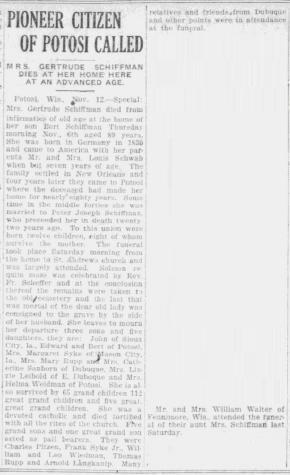 Engelbert Schiffman witnessed the death of Gertrude Schwab on 6 November 1919 at at the home of her son Bert, Potosi, Grant, Wisconsin; Mrs Gertrude (Schwab) Schiffman obituary. Engelbert Schiffman died on 23 March 1920 at Grant, Wisconsin, at age 49.